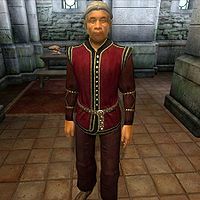 Iniel Sintav, an Imperial commoner, is the head of the Sintav clan, one of the most respected families in the Imperial City. He lives in the Imperial City's Elven Gardens District, and has apparently found employment and houses for several of his relatives nearby. His nephew, Cyronin, has had a dispute with Talos Plaza District's resident Helvo Atius, which has caused bad blood between the Sintav and Atius clans. This page was last modified on 13 March 2017, at 19:18.